Bubble Sort is a simple algorithm which is used to sort a given set of n elements provided in form of an array with n number of elements. Bubble Sort compares all the element one by one and sort them based on their values. 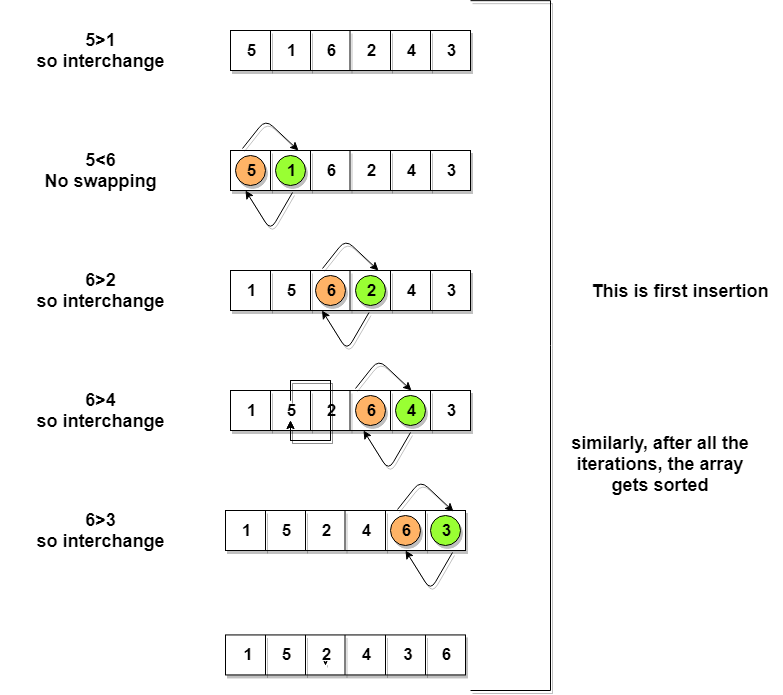 If the given array has to be sorted in ascending order, then bubble sort will start by comparing the first element of the array with the second element, if the first element is greater than the second element, it will swap both the elements, and then move on to compare the second and the third element, and so on. If we have total n elements, then we need to repeat this process for n-1 times. It is known as bubble sort, because with every complete iteration the largest element in the given array, bubbles up towards the last place or the highest index, just like a water bubble rises up to the water surface. Sorting takes place by stepping through all the elements one-by-one and comparing it with the adjacent element and swapping them if required. Starting with the first element(index = 0), compare the current element with the next element of the array. If the current element is greater than the next element of the array, swap them. If the current element is less than the next element, move to the next element. Repeat Step 1. Below, we have a pictorial representation of how bubble sort will sort the given array. So as we can see in the representation above, after the first iteration, 6 is placed at the last index, which is the correct position for it. Similarly after the second iteration, 5 will be at the second last index, and so on. Although the above logic will sort an unsorted array, still the above algorithm is not efficient because as per the above logic, the outer for loop will keep on executing for 6 iterations even if the array gets sorted after the second iteration. So, we can clearly optimize our algorithm. To optimize our bubble sort algorithm, we can introduce a flag to monitor whether elements are getting swapped inside the inner for loop. Hence, in the inner for loop, we check whether swapping of elements is taking place or not, everytime. If for a particular iteration, no swapping took place, it means the array has been sorted and we can jump out of the for loop, instead of executing all the iterations. 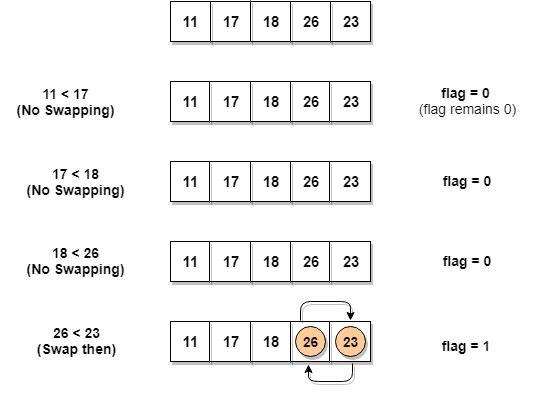 Below, we have a pictorial representation of how the optimized bubble sort will sort the given array. As we can see, in the first iteration, swapping took place, hence we updated our flag value to 1, as a result, the execution enters the for loop again. But in the second iteration, no swapping will occur, hence the value of flag will remain 0, and execution will break out of loop. In the above code, in the function bubbleSort, if for a single complete cycle of j iteration(inner for loop), no swapping takes place, then flag will remain 0 and then we will break out of the for loops, because the array has already been sorted. Hence the time complexity of Bubble Sort is O(n2). The main advantage of Bubble Sort is the simplicity of the algorithm. The space complexity for Bubble Sort is O(1), because only a single additional memory space is required i.e. for temp variable. Also, the best case time complexity will be O(n), it is when the list is already sorted. Following are the Time and Space complexity for the Bubble Sort algorithm.